Our natural woolly puffs™ filled adjustable pillow is the perfect choice for those looking for a fully washable all natural alternative to those synthetic or Poly-fill pillows. Easily adjustable by unzipping the inner cotton case and simply adding or removing some of the woolly puffs™ for the desired support of your head and neck. Wool has an inherent ability to act as a natural thermostat and can regulate body temperature. Far superior to synthetic fibers and breathable, to maintain the perfect sleep temperature all year round. Wool is inherently anti-microbial and resistant to dust mites, mold and mildew. 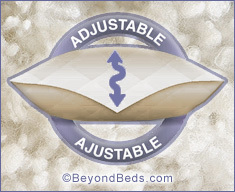 Our adjustable wool pillow is also fully machine washable and dryable, making it one of our most sanitary pillows. A great choice for those with allergies! The quilted cover is zippered on one end for easy access to the inner zippered cotton case that holds the woolly puffs™. 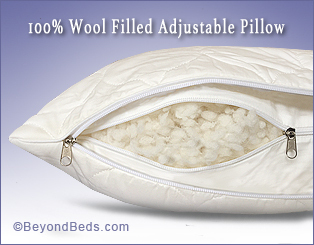 The woolly puffs can be easily added or removed to achieve the desired pillow height. Only fair trade labor and environmentally friendly practices are used in making our wool filled pillow. The wool used in our pillow is from sheep that graze freely in the lush open fields of the Kyrgyz Republic. The factory is SO Certified and uses wind power as an environmentally friendly alternative energy source.